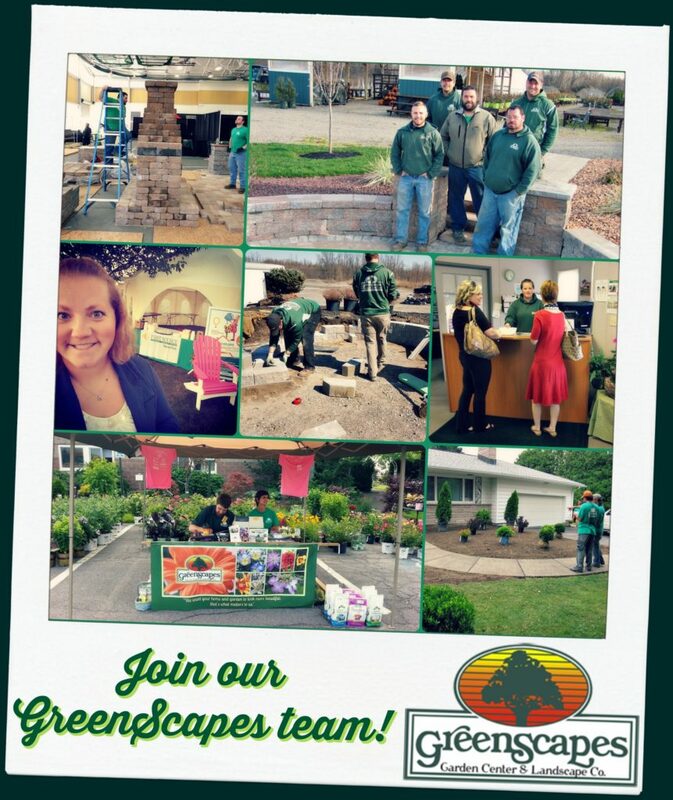 Employment Opportunities - GreenScapes Garden Center & Landscape Co.
We are always looking for new team members! If you are looking for something that gets you outdoors, keeps you active and is rewarding, stop in, e-mail or call for an employment application. We at GreenScapes are seeking Garden Center Associates to join our team. All associates will report to the Garden Center Managers and/or Landscape Foremen. This position contributes to the success of GreenScapes by providing our customers with exceptional service and providing the most desired shopping experience. To adequately assist our customers, we ask that you safely be able to lift 50 pounds, unassisted. For larger items, we do have tools to utilize. The Garden Center is "Open" Spring through Fall, with exact dates dependent on the weather. - Care for all plant materials; including watering, pruning, and tagging. - Assist customers in a prompt, courteous, efficient and knowledgeable manner. - Helps teammates with unloading shipments of plants and other materials. - Willingness to learn about the different types of plants, their habits and best practices for ensuring that our customers are successful with their purchases. - Promotes a positive work environment for themselves and co-workers. - Excellent oral communication skills and a strong positive attitude. - Ability to relate positively with staff and diverse groups of visitors. - Must be able to walk, stand, sit, kneel, reach above head, pull, bend, climb stairs and ladders and carry up to 50 lbs. - Must be able to actively work in inclement weather, and come to work prepared to do so. - Ability and willingness to work holidays, weekends, evenings and any other hours as the schedule demands. We at GreenScapes are seeking crew members to work on our landscape, hardscape and lawn maintenance crews. All crew members will report to the Landscape Foreman. This position contributes to the success of GreenScapes by meeting and exceeding our customer's expectations of their landscape projects. Our crews work Spring through Fall, with exact dates being determined by the weather. - Following the instruction of and learning from the Foreman on our processes for installation and maintenance of residential and commercial projects. - Maintaining a clean, organized and safe work area. - Maintaining clean and organized vehicles, machinery and tools. - Practicing proper treatment and procedures with tools and machinery. - Assist other crews as assigned by the Foreman. - Prior landscape or maintenance experience is preferred, but not required. - Ability to relate positively with staff and diverse groups of customers. - Must be able to walk, stand, sit, kneel, reach above head, pull, bend, climb stairs and ladders and carry up to or over 50 lbs. - Ability and willingness to work holidays, weekends, evenings and and any other hours as the schedule demands. - Must be 18 years of age or over. - Must have a valid New York State drivers license in good standing. GreenScapes is committed to excellence in every phase of operation. The company will continue to improve its position through the application of principled, financially sound business practices. Cater to its clientele’s discriminating tastes by offering a wide range of exceptional products and services. Maintain a highly professional staff that understands and responds to customer’s needs in a friendly, personal manner. Create a “sense of place”. An environment in which people may celebrate the seasons. To succeed in our business, GreenScapes is constantly looking for team players with "can do" attitudes to help achieve these goals. We provide quality products and customer service. We listen to our customers and respond quickly to their needs. We strive to communicate openly and listen to our staff members. Our success depends on high quality staff who are involved in our business and who are empowered to act in the company’s best interest. We strive to provide our staff with the opportunity to grow and learn. We expect high levels of performance and are accountable for our actions and results. We manage our resources well and provide competitive results. We continually improve the quality of everything we do. We hold ourselves to the highest standard of ethical conduct. We insist on safe work practices at all times. We care about the environment and act to protect and improve it.